It's a common misconception that every bank is required to have a notary, but many do have one on staff. Hours and fees vary depending on where you live and which bank you contact. You're most likely to have access to a free notary at a bank where you have an existing account. Credit unions and small community banks have a higher chance of offering free notaries. If your own bank doesn't offer free notary services, ask around. It could be worth opening a no-fee checking or savings account at a bank that has a free notary on staff, especially if you'll need notary services regularly (if you plan on winning a lot of prizes in the future, for example!). Worried about your credit being affected if you open another bank account? As long as you don't go overboard, your credit should be fine. Your local city hall or court office is likely to have a notary on staff, and often they make their services available to the public. There may be a small fee for this service. (for example, Hartford, Connecticut's Town and City Clerk's Office charges $5 while the New York City County Clerk's office offers free notary services for the public). Public libraries offer an astounding variety of services, and in many branches, a notary is one of them. Some libraries offer totally free notary services, while others charge a low fee (around a dollar). Check your public library's website or call your branch to check on availability, prices, and hours. If you don't know where your closest branch is, use PublicLibraries.com to find a library near you that you can call to ask about notary services. Students: Many schools and universities often have free notaries on campus. Military: Many officers are authorized to act as a notary for members of the military and their dependents. Military bases usually have a notary available, though you need to be authorized to be allowed onto the base before you can use the services. AAA Members: Many AAA branches offer free notary services as a membership benefit. If you are a member, you can find your local office here. Your Workplace: Your place of business might have a notary who would be happy to help a fellow employee, especially if you work for a large company. Hotels: When you're on the road, your hotel or resort's business services center is a good place to check. Walt Disney World offers notary services at their Lobby Concierge stations, for example. Other Organizations: If you are a member of any other large organization, check if a notary public is available to you. Many Insurance agencies, real estate agencies, and car dealerships find it practical have notaries on hand for their business transactions. In a pinch, these businesses may be able to help you get your documents notarized. Remember that notaries are public servants, so you shouldn't have to be a customer to use the notary. Mailbox companies like the UPS Store and Mail Boxes Etc.offer a range of business services, often including a notary public. While mailbox stores charge fees for their notary services, the prices start at $1 per signature (prices vary from state to state). Also, mailbox stores may be open outside of regular business hours, which is helpful when you're in a hurry. And you usually can just walk in instead of having to make an appointment with the notary in advance. Not all police stations offer notary services, but many do. There may be a small fee involved, depending on your local department's policies. An internet search for "notary +your_town" (obviously, replace "your_town" with your actual town name). What if you're traveling abroad and need a notary? For example, imagine that you are abroad on a trip you won through an international travel sweepstakes and check your email to find you've won another prize which needs to be notarized before you get home. While that might be a nice problem to have, it is frustrating to think you might lose a prize because you don't know how to find a notary. Every U.S. consulate and embassy offers notary services. You may need an appointment, and the services are often not cheap. If you can get authorization to enter military bases, you may be able to have a document notarized there. Some major hotels offer notaries as part of their business services. You can try contacting a lawyer who deals with Americans, to see if they are able to provide notary services. In a pinch, you may be able to have a local town hall or municipal office notarize your document. An internet search could help you find what you need to ask for in a foreign language. It's a good idea to check with the sweepstakes' sponsor or the issuer of the document that you are trying to notarize to be sure that they will accept a foreign notarization. For certain types of documents, only notarizes found at an embassy or consulate are acceptable. Having a document notarized on a cruise ship is even more difficult than most other international locations. Because notaries are only authorized to witness documents while physically located in the state that issued their license, cruise ships aren't able to provide notary services on board. Your options are pretty limited, but you might be able to arrange to visit a US consulate, embassy, or military base while the ship is docked at a port of call. If you want to make sure that you won't have this problem, you can arrange to give a trusted person at home power of attorney until your trip is over. FedEx Office (formerly Kinkos) no longer offers notary services, due to a legal case where an employee notarized a forged signature. Some companies offer virtual notary services for a fee. However, most states do not accept virtual notarization, because it doesn't satisfy the requirement that "the signer must appear in the presence of the notary" to be valid. LegalLanguage.com provides more information. Anywhere that charges too much for notary services. The maximum amount a notary can charge per signature is mandated by each state, and only a very few states have no limit. Check this list of maximum notary fees by state to ensure that you are being quoted a fair price. 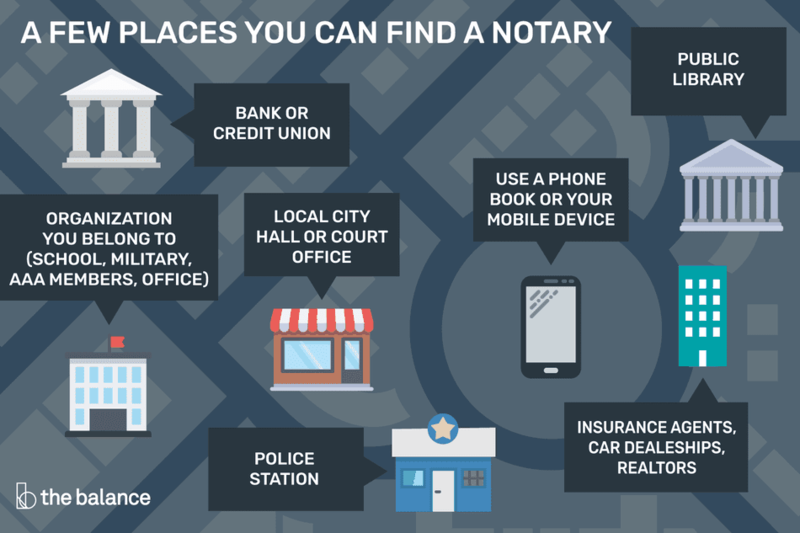 Any notary public that is offering to do a "prohibited act" like notarizing a document without you being physically present, giving legal advice, and more. This is an indication of a fraud.